The women’s soccer team continued its undefeated season this weekend against Sewanee: The University of the South on Sunday afternoon, coming away with a 4-0 victory. The game was supposed to be the Eagles’ second of the weekend, but their clash against Birmingham-Southern College (Ala.), scheduled for last Friday night, was postponed due to weather. The Eagles are currently ranked seventh Nationally among Division III teams, and first in the Atlantic South Region. For the Tigers, ranked eighth in the region, the game marked their second loss of the season. Sewannee got off to a quick start, as sophomore forward Tyler Edell threatened early, forcing Emory goalkeeper Liz Arnold into a save that saw the ball deflect off of the crossbar before going out of bounds for a corner. Shortly afterwards, senior forward Charlotte Butker opened her season’s scoring account, cheekily chipping the Sewanee goalkeeper, freshman Olivia Glascoe, in the 24th minute. Sophomore forward Cristina Ramirez provided the assist, her second of the season. After Butker’s corner kick had been hit around in the box, Ramirez returned the ball to Butker, who scored with a lofted shot. 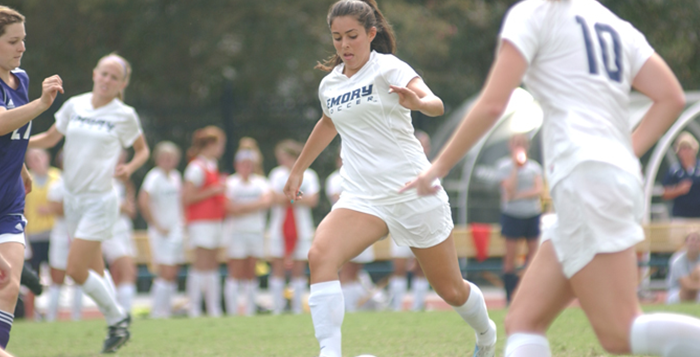 Emory’s second goal, coming in the 36th minute of play, was again a from a corner kick. Senior midfielder Claudia Rowe headed home a corner kick from junior forward Jordan Morell. The goal was Rowe’s first of the year after sitting out the previous three games of the season. Morell’s assist was also her first of the season. The game of firsts continued for the Eagles after half time, as freshman forward Kaitlyn Dorka scored the first goal of her college career in the 58th minute. Dorka raced onto a long ball sent by sophomore defender Bailey Plummer, evaded the final defender and beat the goalkeeper to make the score 3-0 Emory. Plummer assisted Emory’s final goal as well, as Rowe, scoring her goal second of the day, redirected Plummer’s attempted shot into the net. Junior goalkeeper Liz Arnold played the first 70 minutes of the game. Arnold made four saves, her highest of the season. Making her season debut in the last 20 minutes, in place of Arnold, junior Kristin Temple secured the clean sheet for the Eagles, marking their second of the season. Next up for the team is Berry College (Ga.). The Eagles host the Vikings next Saturday, Sept. 20 at 1 p.m., before hosting Capital University (Ohio) at the same time on the following day.